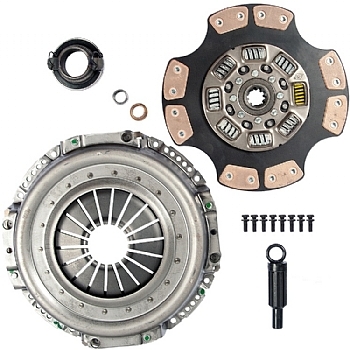 We offer quality clutch kits at very competitive pricing. 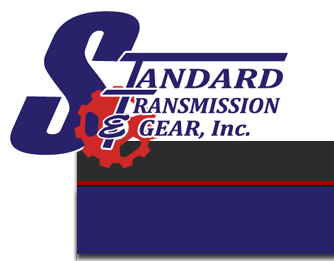 Standard Transmission & Gear is now a proud distributor of AMS Automotive's transmission products. As the premier independent supplier of manual transmission products to the automotive aftermarket, AMS Automotive continues to set the standard for product performance, reliability, and durability! What’s more, we offer nearly 100% coverage on all domestic and import applications for passenger cars and light or medium duty trucks. Rather than creating another “me too” line of new clutch kits, we set out to rethink and improve the way kits are developed, packaged, and sold. Because some vehicles are used in situations where O.E. specs just don’t measure up, we’ve engineered heavy-duty and high-performance Series Upgrade (SR) New Clutch Kits that feature a unique combination of application-specific torque capacity, coefficient of friction, and clamp load characteristics. Each SR Upgrade relies on time-tested proven technology to provide longer life and optimum performance, while also taking into account the fact that each component must work in conjunction with other driveline components. It’s a delicate balancing act. If clamp load and torque capacity ratings are increased too much, component failure will likely occur in other areas such as mechanical or hydraulic linkage. If these ratings are increased too little, the components will simply fail when subjected to the added operating demands. Heavy-duty SR Kits are engineered for activities such as towing, hauling, snow removal, commercial use, and off-road use. They feature beefier diaphragm or coil springs for increased clamping power, heavier gauge components, and alternative friction material compounds. High-performance SR Upgrades are engineered primarily for modified street use. They feature ductile iron castings along with performance grade components like chrome vanadium springs and heat treated pins, levers, yokes, and eyebolts. Spring pressure is also increased for added clamping power. The results are quick-clean engagement and longer life along with increased resistance to higher rpm’s and operating temperatures. Heavy-duty and high-performance SR Kits are available in three levels or “series” called SR100, SR200, SR300. Each series is engineered to meet distinctly different torque, horsepower, and usage requirements. SR100 Kits are designed for applications in which a mild improvement in clutch capacity is required. Organic friction material is utilized in order to provide drivability characteristics that are similar to the stock clutch. The organic material is usually bonded to a steel backing plate yielding higher burst strength capacity. SR100 Kits yield minimal mating surface wear and are therefore ideal for drivers with limited manual transmission experience. SR200 Kits are designed for applications in which a significant improvement in clutch capacity is required. Kevlar or High Density Aramid friction material is utilized in order to provide engagement characteristics that are similar to the stock clutch. Nevertheless, the coefficient of friction rating for Kevlar is 30% higher than O.E. organic friction material. Kevlar material offers less mating surface wear than sintered metallic material. Series 300 Kits are also designed for applications in which an extreme improvement in clutch capacity is required. Miba sintered metallic friction material is utilized in order to provide the highest coefficient of friction, although mating surface wear is increased and drivability is more abrupt. As a result, SR300 Kits are not recommended for drivers with limited manual transmission experience. Keep in mind that friction material is one of the primary factors in determining the longevity and drivability of any clutch system. Recommendations for friction material choice are largely determined by operating conditions and desired driving characteristics. 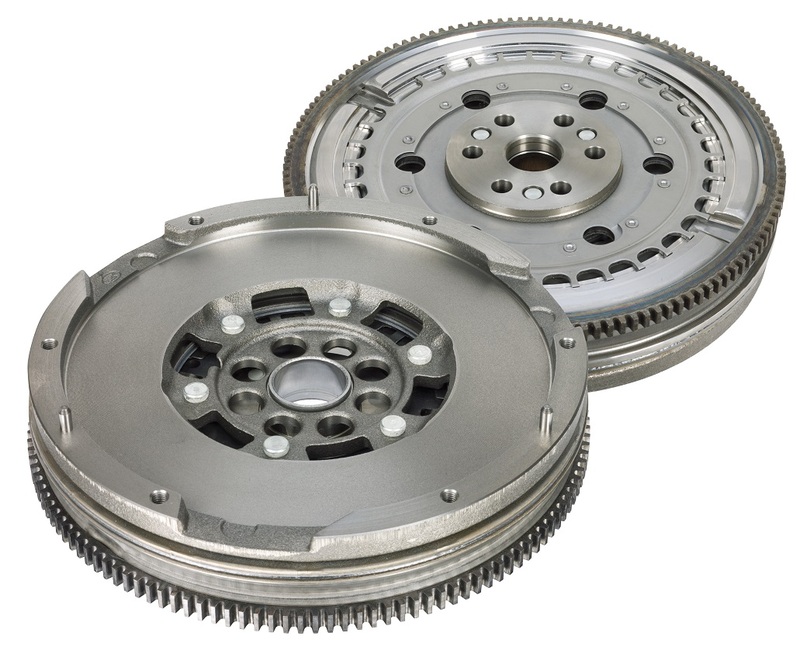 In order to ensure optimum performance and lasting durability with every clutch installation, it’s important to use only quality clutch components that are engineered to function as a precision-matched system with other driveline components. That’s why, where applicable, every AMS clutch kit contains an all-new pressure plate assembly, disc assembly, release bearing, pilot bearing/bushing and alignment tool, designed for specific vehicle applications and driving styles. Because few applications are identical in terms of driveline requirements, we don’t rely on low-grade substitutes in vehicles that demand the use of specific technological designs. Nor do we rely on low quality components produced in so-called “emerging markets”. These types of products simply can’t match our criterion of providing only those clutches which have been engineered and manufactured to the O.E. tolerance and performance specifications of major automobile manufacturers throughout the world. As a final measure of quality, each kit component must pass stringent performance assurance tests. While some organizations may view parts proliferation as a threat, we look at it as an opportunity to set ourselves apart from the competition. 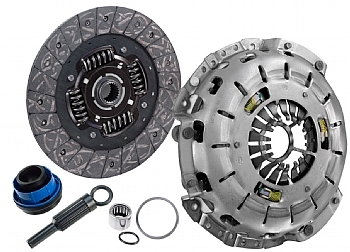 Our extensive line of new clutch kits includes coverage on nearly 100% of all domestic and import applications for passenger cars and to light-medium duty trucks being driven in the U.S., Canada, and Latin America. Shortly after nameplate introduction of a new vehicle, we utilize our product expertise to begin researching and testing components. When these efforts are combined with our strong O.E.M. relationships, we are almost always first to introduce kits for these late model applications to the aftermarket. In addition, we provide unsurpassed coverage on original style kits for older applications, while also including various pressure plate and disc assembly options for these same applications. When special upgrades are needed to resolve inherent problems in certain applications or driving styles, our offering of heavy-duty and high-performance Series Upgrade (SR) New Clutch Kits lead the industry. Available in multiple unique platforms, each SR Kit is engineered to meet distinctly different torque, horsepower, and usage requirements. Finally, for the discerning import specialists that insist on nothing but the exact O.E.M./O.E.S. fit, form, and function, we offer a comprehensive lineup of Select Engineered (SE) Premium New Clutch Kits. By design, clutches are meant to wear out, but they shouldn’t fail due to poor workmanship, engineering, or materials. The fact is that too many clutches do fail prematurely because there are well-disguised replacements that are built using inferior raw materials, unskilled labor, and third-world technology. AMS clutch kits are different. We believe high quality has no substitute and we never take short cuts that might compromise our commitment to offering the highest quality products available. That’s why every AMS clutch kit is backed by the industry’s most extensive and reliable warranty against defects in workmanship and materials. All kits are warranted for a limited period of 12 months or 12,000 miles, whichever occurs first, except SR Upgrades, which are warranted for a limited period of 3-months or 3,000 miles. All warranty claims must be submitted and shipped to the distributor from which the product was purchased. AMS clutch kit packaging has set a new standard in function and appearance. While other suppliers still insist on conventional packaging methods such as plastic “skin wrap” or cardboard inserts, AMS utilizes the latest available biostable foam technology. This advanced type packaging protects components against damage during shipping and handling, and also allows for inspection of the product, without destroying the basic protective function of the package. In addition, our unique SleevePac design uses a UV varnish coating that protects the package against dirt, resulting in increased shelf life. Finally, the award-winning graphic designs used on our SleevePac show how proud we are to offer only the best of the best. Through the use of crisp product images and a listing of many of the O.E. products contained in AMS kits, our message of high quality is clearly spelled out in multiple languages. This list is temporary and will be updated soon for ease of use. Please call for your application. Each new flywheel is engineered and manufactured to O.E.M. specifications, using premium grade iron, new ring gears, and new dowel pins. To reduce vibration and maximize performance, each unit is dynamically balanced, backed by our comprehensive warranty, and priced competitively. Click to go to our Flywheel & FW Conversion page. Flywheels are bolted to the engine crankshaft and serve as the mounting-surface of the clutch assembly, while also acting as a heat sink to dissipate heat from the pressure plate and disc. During engagement, the disc is clamped between the pressure plate and flywheel, resulting in power transfer from the engine to the transmission. Contact between the flywheel and disc will naturally cause hot spots, grooves, thermal cracks and/or frequent concave warpage. Therefore, the flywheel should always be replaced or resurfaced during each clutch system replacement. Keep in mind, some flywheels are virtually impossible to resurface. Equipment plays an important role in the quality of the flywheel surface. AMS does not recommend the use of brake rotor lathes or small tool room lathes. Hot spots are significantly harder than the surrounding flywheel material. 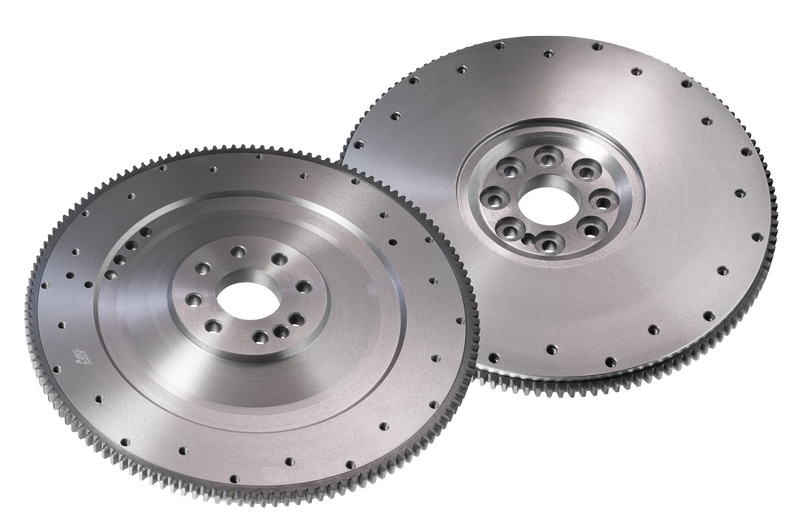 Brake rotor and small tool room lathes do not have the required cutting capacity to allow the cutting tool to remove hot spots in a uniform manner. Instead, a flywheel grinder or CNC lathe should be used. No specific guidelines exist regarding the maximum amount of metal that can be removed from the friction surface. Removing too much metal may result in a no-release condition, because the mounted position of the flywheel and clutch assembly has been moved away from the release mechanism (AMS does NOT suggest the use of shims). An over-machined flywheel may also destroy the heat sink capacity and create a safety hazard. Conversely, if hot spots and wear flaws are not removed, and the flywheel is not returned to like-new flat condition, power transfer and component life will be minimized by chatter, slipping, and heat build-up. Further complicating matters, many flywheels utilize either a recess or step configuration, in which flywheel mounting-surface is higher or lower than the actual wear surface. It is imperative to maintain the proper step or recess dimension. Before grinding, the pressure plate mounting-surface should be measured relative to an unworn portion of the wear surface. While it may be difficult to find these specifications in O.E.M. manuals, the proper dimensions can be double-checked in any AMS catalog. Many late-model vehicles actuate the clutch system using a hydraulic clutch master cylinder and slave cylinder, rather than mechanical linkage. When the clutch pedal is depressed, the pushrod on the master cylinder displaces fluid from the cylinder, through a tube, to the slave cylinder. In most instances, the piston attached to the slave cylinder moves a release fork, attached to a release bearing, in order to disengage the clutch. On other systems, the slave cylinder piston pushes forward against a release bearing to disengage the clutch. Hydraulic systems are designed to reduce pedal effort, and to simplify installation by more directly connecting the pedal to the clutch. They also eliminate the need for failure-prone items like return springs and cable mechanisms. Because hydraulic systems have built-in pedal travel already factored in, periodic adjustment is usually not required. Problems generally arise when either the master cylinder or slave cylinder leaks hydraulic fluid, draws air, or fails to maintain adequate pressure required to disengage the clutch. If one of the components is damaged or leaks, it should be replaced before new clutch components are installed. On high mileage vehicles, it is also advisable to replace both components, even if only one of the components appears damaged. That’s because both components are designed with the same expected service life. The AMS clutch hydraulics program provides industry-leading coverage on nearly 100% of all applications. 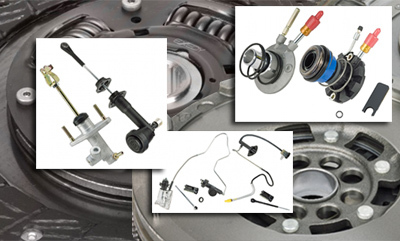 Each sku is cataloged alongside the other components required for a complete clutch system replacement. Application specific tech bulletins and proper bleeding procedures are included with many sku’s. In addition, we use an “exact fit” approach, rather than relying on “will fit” aftermarket consolidations. This provides assurance of proper fit with the other components, and eliminates the need to search multiple catalogs for the necessary components. The function of a slave cylinder is primarily controlled by the master cylinder. Slave cylinders are divided into two primary categories: Concentric slave cylinder (CSC) and external slave cylinder. Since their introduction in light truck applications in the late 1980’s, clutch release systems containing a concentric slave cylinder (CSC) have become the hydraulic system of choice in domestic applications. Not only are they reliable and easy to troubleshoot, they also eliminate the need for other parts such as the release fork, quill, and pivot linkage. In many instances, the CSC is equipped with a replaceable angular contact release bearing. Because the thrust face surface of this bearing maintains constant contact with the pressure plate diaphragm spring, the bearing may fail before the remainder of the CSC. When installing a new clutch kit in a CSC equipped application, it’s important to always inspect the hydraulic system. If it is operating properly, simply replace the old release bearing with a new release bearing (contained in the clutch kit), along with the other components found in the kit. However, if the clutch will not release and/or the hydraulic system is leaking or will not bleed properly, a new CSC should be installed, along with a new master cylinder and clutch kit. In this instance, the technician is now forced to purchase two release bearings, one that’s contained in the kit and one that’s already attached to the new CSC. The clutch master cylinder is directly connected to the clutch pedal and serves as the portion of the hydraulic system that generates hydraulic pressure. Master cylinders are divided into two primary categories based on the internal mechanism used to generate hydraulic pressure: seal over port systems and center-feed type systems. The seal over port system uses a push rod attached to the clutch pedal to produce piston movement in the master cylinder. When the piston moves, seals attached to the piston move forward. The primary seal passes over a small port in the wall of the cylinder, which allows fluid flow to and from the reservoir. Once the primary seal passes over the port, the fixed portion of fluid contained between the master and slave cylinder is moved toward the slave cylinder. This results in disengagement of the clutch. 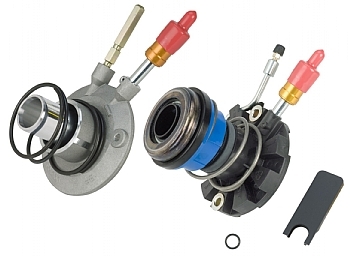 One variation of the seal over port is a plunger type master cylinder. Rather than using the attached seals that move with the pistons, the piston instead moves through the seals. The center-feed type system uses small hooks attached to the nose of the piston. When the clutch pedal is not depressed, these hooks engage a flange on the valve stem. A circular rubber seal on the opposite end of the valve stem is held away from the master cylinder body. This allows fluid flow to and from the reservoir. When the clutch pedal is depressed, the hooks no longer hold the valve stem and it is pushed to the bottom of the master cylinder body. The reservoir is now separated from the fixed fluid, contained between the master and slave cylinder. As the clutch pedal is further depressed and the master cylinder piston moves even further, fluid is forced toward the slave cylinder, resulting in the disengagement of the clutch. Master cylinders are also subdivided into two additional categories: Integral reservoir systems and remote reservoir systems. The fluid reservoir of an integral reservoir system is part of the master cylinder body. The fluid reservoir of a remote reservoir system is attached to the master cylinder body via a rubber hose. The use of integral or remote reservoirs is dictated by the available room in the engine compartment. Both integral and remote reservoir types are used in seal over port and center feed type systems. Late model hydraulic systems require a variety of complex bleed procedures. Obtaining this information is challenging, and properly bleeding these systems is even more difficult. The bleed procedure on a dry system can take up to an hour or more. To resolve these problems, AMS offers the industry’s first and most comprehensive lineup of pre-filled clutch hydraulics, available as a pre-filled system or a pre-filled master cylinder. Each system is pre-filled with hydraulic fluid and pre-bled, eliminating the need to perform this often-difficult task when the components are installed on the vehicle. When compared to the installation of dry components, shop time and the risk of warranty are substantially reduced. This system includes a master cylinder and slave cylinder, connected by the hydraulic line. No additional components are required, however, the pre-filled system may also include features such as a pulsation damper, heat shield, or neutral safety switch. 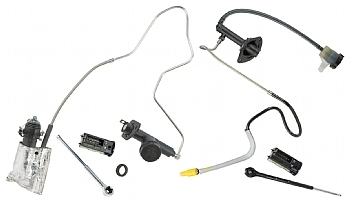 These added components aren’t generally included with the individual master or slave cylinder. The design of these components makes conventional bleeding difficult and time consuming. For example, if the built-in pedal pulsation damper becomes contaminated, the system becomes nearly impossible to bleed. In addition, it is especially difficult to remove air from the damper. The pre-filled system eliminates these difficulties. This system includes a master cylinder connected to the hydraulic line (includes male quick disconnect). The system must be used with the existing O.E.M. slave cylinder or with a dry slave cylinder purchased separately. This system is designed for applications that include a Concentric Slave Cylinder (CSC) inside the bell housing. In addition, the master cylinder is typically mounted at an angle that makes conventional bleeding difficult and time consuming. After installation of the clutch and pre-filled master cylinder, a two-minute procedure to fill the CSC is all that is required. By comparison, the Ford-approved bleed procedure on a dry system can take up to an hour or more. The quick disconnect is the vulnerable component in this system. It is prone to leak due to component deterioration, and the female portion (attached to the CSC) or male portion is routinely broken during removal because the proper removal tool was not used. 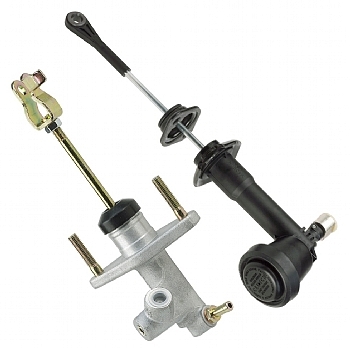 Rather than installing a complete pre-filled system, replacing that portion of the quick disconnect that is damaged (master cylinder and hydraulic line or the CSC) reduces the overall cost.